National Catholicism (Spanish: Nacionalcatolicismo) was part of the ideological identity of Francoism, the dictatorial regime with which Francisco Franco governed Spain between 1936 and 1975. Its most visible manifestation was the hegemony that the Catholic Church had in all aspects of public and private life. 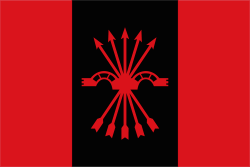 As a symbol of the ideological divisions within Francoism, it can be compared to National syndicalism (nacionalsindicalismo), an essential component of the ideology and political practice of the Falangists. Valle de los Caídos in El Escorial, exemplary building of the francoist era-style. In the 1920s France, Édouard Castelnau's Fédération nationale catholique advanced a similar model. Although it reached one million members in 1925, it was of short-lived significance, subsiding into obscurity by 1930. In the 1930s and 1940s, Ante Pavelić's Croatian Ustaše movement espoused a similar ideology, although it has been called other names, including "political Catholicism" and "Catholic Croatism". Other countries in central and eastern Europe where similar movements of Franquist inspiration combined Catholicism with nationalism include: Austria, Poland, Lithuania and Slovakia. ↑ Frank Tallett (2003). Catholicism in Britain & France Since 1789. Continuum International Publishing Group. pp. 152–154. ISBN 978-1-85285-100-2. ↑ Maurice Larkin (2002). Religion, Politics and Preferment in France since 1890: La Belle Epoque and its Legacy. Cambridge University Press. p. 157. ISBN 978-0-521-52270-0. ↑ Stanley G. Payne (1996). A History of Fascism, 1914–1945. University of Wisconsin Pres. p. 406. ISBN 978-0-299-14873-7. ↑ John R. Lampe (2004). Ideologies and National Identities: The Case of Twentieth-Century Southeastern Europe. Central European University Press. p. 102. ISBN 978-963-9241-82-4. Stanley G. Payne (1984). "7. National Catholicism". Spanish Catholicism: An Historical Overview. University of Wisconsin Press. ISBN 978-0-299-09804-9.